Hi my name is Kieren Olney and I am one of the new car sales consultants here at Toowong KIA. I have the pleasure of driving a large range of cars in my time in the automotive sector and would to share my thoughts with you on the Kia Sportage Series 2 Platinum. The Series 1 Sportage is a great SUV that holds up well to its competitors but now the Series 2 is here with new and enhanced features, but that great European styling that made the Sportage stand out from the rest is back and available in new and exciting colours as well as the colours that made the Sportage stand out. 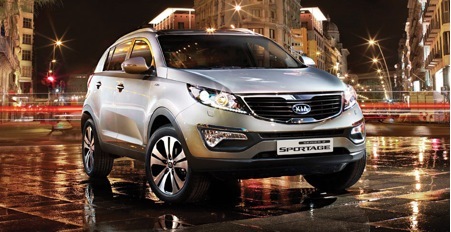 The ride and handling of the Series 2 Sportage have been improved giving even more comfort while driving. The HID lights (High-intensity discharge lamps) on the Platinum Series 2 make the road more visible along with the addition of static cornering lights to all models help to avoid and incidents by giving you more light to be able to see the road clearly. The day time running lights make the car looking classy but also help with improved visibility for other drivers. Rear parking sensors help to avoid hitting objects, but with the addition of the reverse camera help to avoid running over to hitting toys of a person. In The Series 2 sits (your choice) a 2.0lt turbo Diesel or a 2.0lt Petrol engine both gives great fuel economy. Kia has taken the comfort of all the passengers in mind and has added seat warmers for the front and rear of the car as well as making the seat comfortable. The back seats can very comfortably seat 3 adults while in the front the driver’s seat has lumbar support for those long drives. The cooling glove is a great feature when you want to keep those drinks cold or food fresh while driving long distances. 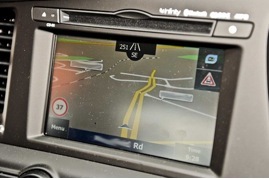 The factory fit satellite navigation is fast and easy to use. With the addition of live traffic updates you will always know if the is an accident ahead of you. 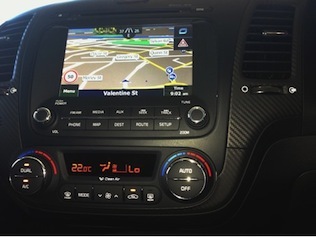 The Bluetooth media streaming and phone connection is great really easy to use and everything is right in front of you, the Sportage downloads your contacts, call history from your phone so there is no need to guess how is calling you. The dual zone climate control is great at stopping those I am to hot or cold issue. With the front passenger and the driver being able to change the temperature to what they want. 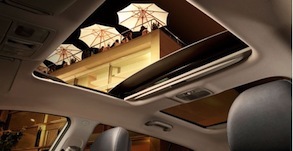 The passengers in the back will get a sore neck looking out of the panoramic sunroof with the sunroof at the front able to tilt and slide over the rear sunroof. Hi my name is Kieren Olney and I am one of the new car sales consultants here at Toowong Kia. I have the pleasure of driving a large range of cars in my time in the automotive sector and would to share my thoughts with you on the Kia Cerato SLi. The Cerato has undergone a radical transformation from the previous model, with an amazing European style thanks to the ex-Audi designer Peter Schreyer makes this car stand out from the rest. The Cerato SLi house a 2.0L GDi engine that produces 129Kw of power and 209Nm of torque while using less fuel but still produces more power than the previous Cerato. The ride and handling have been improved with the addition of electric power steering that allows you to select different drive modes from a comfortable feel which is ideal for city driving or parking lots, to a sportier feel which is great for highway driving. 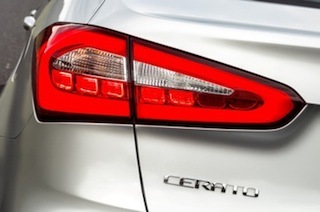 The Cerato has loads of safety features from the brake assist system, hill start assist control, Emergency Stop Signal as well as Front and Rear parking sensors and a reversing camera which helps to see and avoid any potential accidents. 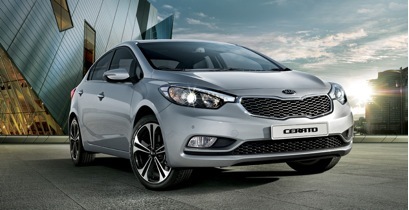 The Cerato has a certain appeal especially with the addition of the SLi’s 17” Sporty Alloys. The interior of the Cerato feels luxurious and sporty with the optional Satellite Navigation system with live traffic updates that will offer you directions around the incident and estimate delay time. The humidity sensor attached to the inside of the windscreen prevents the windscreen from fogging up. The comfort of the driver and passengers haven’t gone unchecked with the comfortable seats and the addition of the driver’s seat being heated and cooled. A great feature of memory 8 way powered driver’s seat is a must for multiply drives, as the car will store your seating position and at a press of a button will revert back your position. Bluetooth connectivity with media streaming so there is no longer a need to touch your phone while driving. The attention to detail in the Cerato is just amazing, soft touch surfaces, the styling and the feel of the interior of the car even in the rear seats makes the car feel well thought out and complete. All the features and styling you would expect from a high end luxury sedan can be found in the Cerato SLi. With the addition of every car being tuned to Australian conditions makes it a comfortable and Sporty ride with an amazing price tag to compete and or beat all cars in the Cerato’s category. Hi my name is Kieren Olney and I am one of the new car sales consultants here at and Toowong Kia. I have the pleasure of driving a large range of cars in my time in the automotive sector and would to share my thoughts with you on the Kia Optima Platinum. The Optima is a wonderfully designed car that is loaded with technology and offers a sleek European styling that is sure to turn heads. The Optima houses an impressive 2.4L GDi engine that produces 148Kw of power and 250Nm of torque while still giving great fuel economy. The strong lines and stance that begin at the front and follow all the way to the rear of the car adds a certain beauty and sportiness that is unique to the Optima. With the addition of the Sporty 18 inch alloy wheels just completes the look and feel of the Optima. A great amount of time has been spent on the entire design and is visible on the exterior and even more so inside. The comfort of having 8 way power adjustable driver seat with memory function means your seat position is available at the push of a button even if someone else has been driving the car. The Optima houses amazing technology from the smart key and push button start to heated and cooled drivers and ventilated passenger seat. 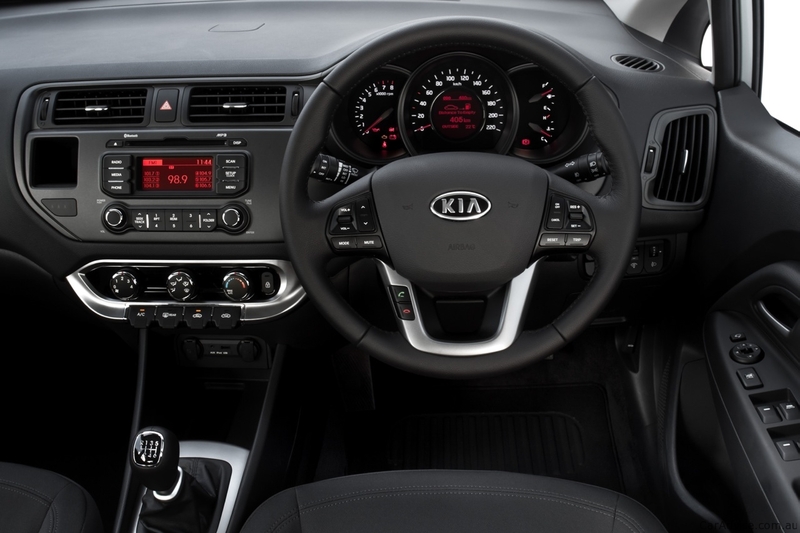 The Optima’s interior has been designed with ease of access without losing the luxurious looks. 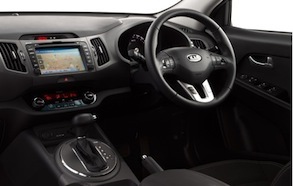 The audio, cruise control, Bluetooth and trip computer controls are all located on the steering wheel, this allows the driver to change the audio or answer calls without taking their hands off the steering wheel which makes for a safer drive. The audio and satellite navigation system is pointed 9 degrees towards the driver to provide enhanced visibility and easy access to the climate controls. The rear seats are able to seat 3 full adults with amazing leg room and comfort. With the addition of a panoramic sunroof, passengers of all ages will be looking out at the sky from the comfort of their seat. 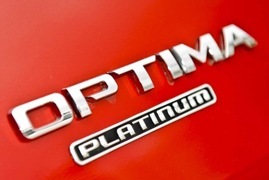 All the features and styling you would expect from a high end luxury sedan can be found in the Optima Platinum. With the addition of every car being tuned to Australian conditions makes it a comfortable and luxurious ride with a reasonable price tag to compete and beat all cars in the Optima’s category. 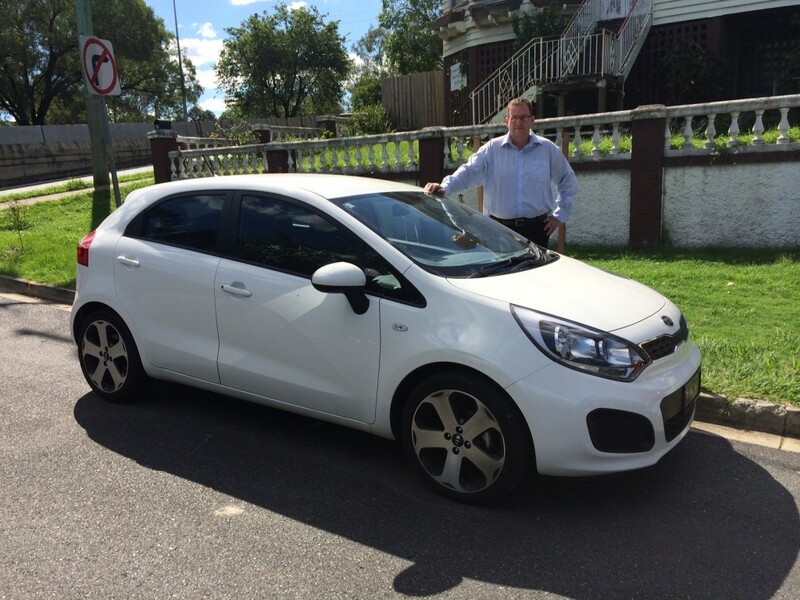 Hi my name is Scott Douma and I am one of the new car sales consultants and Toowong Kia. I have driven a large range of cars in my time in the automotive sector and would like to share with you some of my thoughts on the Kia Optima. The Kia Optima is a wonderfully engineered car in both design and technology. With european styled looks it really is a head turner. The lines from beginning to end inspire beauty and sportiness. You can just tell that the car will glide through the air with little resistance, which will improve performance, fuel economy and noise. 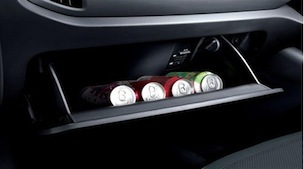 The interior is ergonomically designed with ease of access without substituting looks. The on steering wheel controls for radio/media as well as cruise and bluetooth makes for a safer drive ensuring the driver doesn’t have to remove there hands from the control of the car. The seating is perfectly designed for comfort, long or short you will arrive at your destination relaxed and ready for what ever life throws at you. Rear seating is more than adequate with the perfect seat depth for leg support as well and enough giggle room for kids of all sizes to kick around. Boot space in the car is enough to put 2 large suit cases and 2 small bags nicely. Over all the car is well setup with handling and drivability to rival most cars in its class and a price to beat them all. Scott Douma – New car sales executive, Toowong Kia. Kia’s baby Rio and the stylish Sportage compact SUV have scored an impressive duo of wins in the Australian Automobile Association’s prestigious Australia’s Best Cars awards. Rio Si backed up its success of last year, defending its title in the hotly-contested Best Light Car under $20,000 category while the Sportage SLi AWD petrol took the crown in the Best SUV under $40,000 category. “This is a wonderful result in two of Australia’s most popular segments _ a genuine endorsement of the work Kia has been doing to provide cars to Australian buyers with the key qualities of safety, quality and enjoyment,” Kia Motors Australia Chief Operating Officer Tony Barlow said. Mr Barlow said having two cars on the winner’s dais _ and another two (Optima and Sorento) as finalists _ was reason to believe Kia was heading in the right direction. The judging panel also praised Kia for the work done to offer Australian drivers the type of behind the wheel experience they desire. The new face lifted Peter Schreyer-styled Kia Sorento’s upgrades are much more than skin deep. 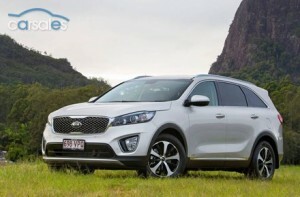 Ian Crawford road tests and reviews the new Kia Sorento with specs, fuel economy and verdict. A month after the release of its Hyundai seven-seat Santa Fe SUV cousin, Kia’s 2013 Sorento has arrived in Australian dealerships. Kia says that Ford and Toyota have found that more than 50 per cent of their Territory and Kluger sales are 2WD models – a clear demonstration that there is a significant market – especially in urban areas – for large family SUVs. The 2013 Sorento range starts from $37,490 for the automatic Si 3.5-litre petrol two wheel drive and climbs up to $50,390 for the Platinum 2.2-litre turbo-diesel four wheel drive. Alloy wheels ranging from 17-inch versions on the Si to 19s on the top-spec Platinum are fitted and each has a full-size alloy spare. Other across-the-range standard features include cruise control, a leather-wrapped multi-function steering wheel and shift knob, a six-function trip computer, remote central locking with keyless entry and tailgate release, power windows and exterior mirrors, nice big sun visors with pull-out extenders, dual-zone climate-control air and tinted glass. All models come with an MP3-compatible, six-speaker CD/AM/FM audio system, AUX/USB input and iPod compatibility, Bluetooth functionality for phone and media streaming. The list goes on and on and for the top-spec Platinum there is a huge panoramic sunroof, satellite navigation and climate-controlled front seats. All three versions have front-and-rear parking sensors and both SLi and Platinum models add a reversing safety camera with a 130 degree wide-angle lens. The Platinum also gains active high intensity discharge Xenon headlights. While at first glance exterior styling changes appear minimal, under the skin there’s a raft of upgrades that have improved the big Korean no end. That said, so far as its persona is concerned, there are new headlights and LED daytime running lights and new-look LED taillights as well as a redesigned grille and tailgate and new bumpers and wheels. One of the good-news stories for the new Sorento’s passengers is that Kia’s clever designers have been able to give second-row seat occupants another 30 mm of leg room and those in the third-row pews can stretch out another 9 mm. Family buyers will welcome not only the seven-seat capacity but a raft of storage cubby holes and a cargo space that, depending on the second- and third-row seats are occupied or folded flat, ranges from 258 litres to a whopping 2700 litres. Split-folding second- and third-row seats add greatly to the Sorento’s cargo flexibility. In summary, it’s surprising how much better the new face lifted Sorento is than its look-alike predecessor. 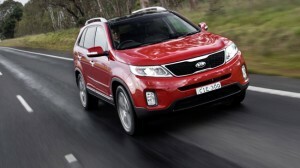 Unlike its Santa Fe cousin which is a 4WD-only vehicle, the buyers of the new Sorento can opt for a 2WD petrol version. At launch, the new Sorento is available with two engine choices – one petrol and one turbo-charged and inter-cooled diesel. A 141 Kw/242Nm 2.4-litre direct-injected four-cylinder petrol engine could be added down the track. The 2.2-litre turbo-diesel is good for 145 kW of maximum power at 3800 rpm and 421 Nm of peak torque (manual) and 436 Nm (automatic) that is on tap between a lazy 1800 and 2500 rpm. A new exhaust-gas recirculating system has cut CO2 emissions from 177 g/km to 153 g/km and Kia claims a combined fuel-consumption figure of 6.6 litres/100 km for the manual version and 7.3 litres for the automatic. The 3.5-litre V6 petrol engine delivers 9.8 L/100km and its power and torque figures are 204 kW at 6300 rpm and 335 Nm at 5000 rpm respectively. The transmission for all models bar one is the Hyundai/Kia group’s excellent sequential-sports-shifting automatic. The exception is the 2.2-litre diesel Si six-speed manual 4WD. Kia says an 18 per cent boost in torsional rigidity has refined the ride comfort and improved its handling. Adding to the handling improvements are various design and engineering tweaks to the MacPherson-strut front and multi-link rear suspension set-ups and upgraded cross-members. Over the years both Kia and Hyundai received their share of criticism about poor handling. To their credit, both companies have taken the negative reviews on board and these days they put a great deal of time, money and effort into local testing and tuning their underpinnings for Australian conditions. In Kia’s case, suspension engineering wiz Graham Gambold has worked closely with Australian and Korean engineers and product-planning people on setting up vehicles for this market. Stronger sub-frames, beefier anti-roll bars and dual-low dampers have been fitted and like the new Santa Fe, the motor-driven power-steering has three settings – normal, sport and comfort modes. The new Sorento rides on Kia’s interpretation of the new Santa Fe’s platform and engineers have used new ultra-high-tensile steel to endow the car with greater rigidity and enhanced crash protection for its occupants. As well as boasting a stronger body shell that means better front, side and rear impact protection, all models come with dual front airbags, front side airbags and side-curtain airbags for front- and second-row occupants). Standard too is Kia’s vehicle-stability management system that bundles stability control, traction control, ABS anti-lock brakes, electronic brake-force distribution, brake assist, hill-start assist and downhill brake control. Also standard are front-and-rear parking sensors while the SLi and Platinum variants add a reversing safety camera with a 130-degree wide-angle lens. Platinum models also gain active HID (high-intensity discharge) Xenon headlights. Bigger (320 mm) ventilated front discs and the carried-over 302 mm rear discs have improved the Sorento’s stopping power and Kia claims that if the driver jumps on the brakes at 100 km/h, the big SUV will stop in an impressive 36.3 metres. A maximum safety rating helped along by driver- and front-passenger airbags, front side airbags, curtain airbags active front head restraints and other safety goodies combine to make the new Sorento an extremely safe family chariot. Like virtually everything from Korea these days, the Sorento – even the entry-level Si version – comes with an impressive standard-kit inventory. Active driver aids include Kia’s vehicle stability management system with electronic stability control, traction control, ABS brakes, electronic brakeforce distribution, brake assist, hill start assist and downhill brake control. While on the subject of brakes, the Sorento has one of those horrible foot-operated parking brakes. Out on the road both the petrol and diesel versions are surprisingly spirited vehicles and hills and rapid overtaking are dispatched with ease. Irrespective of which engine is under the bonnet, one of the first things you notice is how quiet the Sorento’s cabin is. This is the result of a great deal of work by Kia engineers to cut noise, vibration and harshness levels. While the front seats are comfortable enough, a bit more thigh bolstering would be handy – especially for the leather-trimmed Sli and Platinum versions during enthusiastic cornering on winding roads. Speaking of cornering, the newly tweaked suspension settings delivers flat, confident cornering and precise turn-in and while the motor-driven power-steering system’s ‘Sport’ mode is great during highway cruising, we found ‘Normal’ to be a better bet on the twisty bits. It’s a quieter, more comfortable, more handsome, roomier and better-handling vehicle that offers value-for-money family motoring.